We round up our favorites from Collective Design Fair, showcased within Skylight Clarkson Square's new deconstructed exhibition space. With this year’s Collective Design Fair moving up to coincide with Armory Week from March 9-11th, the fair is showcased within Skylight Clarkson Square’s new deconstructed upstairs exhibition space. Below is a roundup of our favorite pieces. Coil + Drift debuted their multidisciplinary project Unconscious Forms, which comprised of new Coil + Drift objects, a live performance installation, and an original short film by Charlie Schuck. 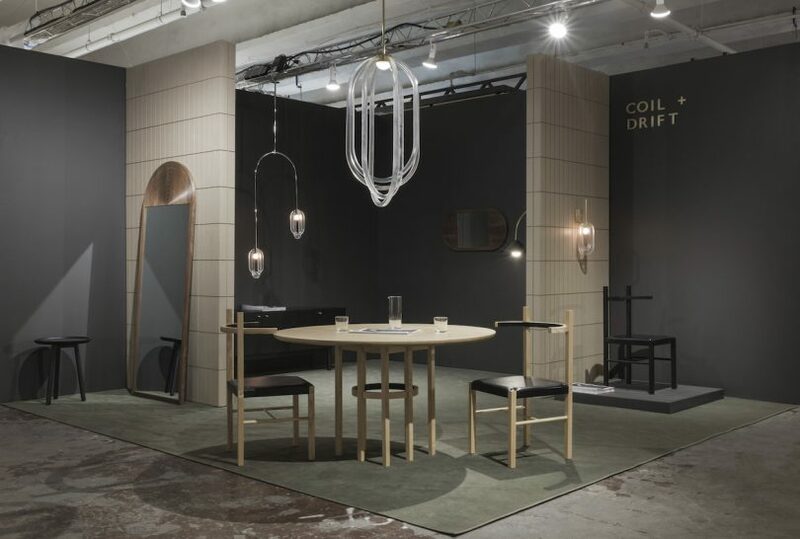 The collection consists of the June Floor Mirror, Cirrus Double Pendant, and Rex Credenza. Harry Nuriev of Crosby Studios presented an all-purple revolving table that was inspired by Nuriev’s childhood. The designer grew up surrounded by merry-go-round playground equipment in Russia, and the wallpaper backdrop, created by Wallpaper Projects, is the exact neighborhood in which he grew up. The Dream is a booth installation by Fernando Mastrangelo inspired by Henri Rousseau?s paintings featuring a sunken living room along a curved sand-cast backdrop. The curved sofa is matched with a built-in shelf, planters, and oval coffee table that uses his signature texturing technique.